I’m staying at La Luna nel Pozzo in Puglia, Italy. It’s the theatre school, run by our dear friends Robert McNeer (above with Chris) and his wife Pia Wachter, where Chris trained and taught clowning for many years. We often came here together to play and laugh under the sun. It’s also the second stop on my long peregrination with Chris’s ashes. I’m here to join Robert, Pia and their daughter Angel to say goodbye to Chris the clown. There’s a wonderful stone amphitheatre in the grounds that “called to me” as I walked around looking for a place to receive the container of ashes I had brought with me. Behind the open stage, is a small self-set pine tree that, according to Robert, “just appeared one day.” We decided that it was the perfect spot for Chris: up-stage and centre, in full view of the audience. Pia and Angel watched as I scraped a small pit under the tree and carefully decanted the ashes. Robert poured libations of olive oil and wine on my hands as I mixed the ashes into the soil together with some olives, grapes and almonds grown in the garden. We topped it off with a red nose, back-filled the remaining soil and smoothed it over. 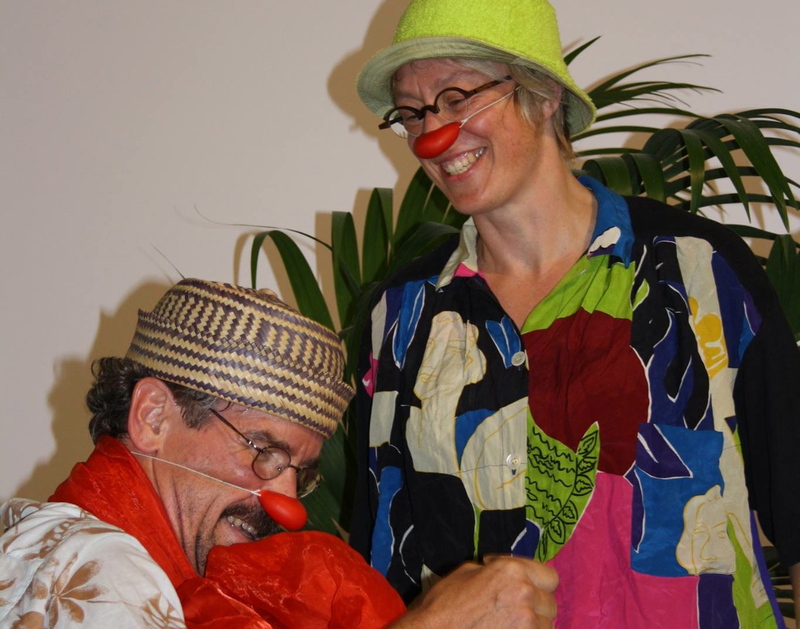 Then we put on our hats and our own red noses and made our clown farewells. We took some pictures and finally, sat side by side under the pine tree, reading poems and other words we had written for Chris. This is my poem, written an hour or two before our little ritual. In the tradition of clowning that informed our training, a rope is used to denote the boundary between on-stage and off-stage. Farewell sweet clown, no longer bound. you crossed the rope and left the stage. delighted grin, and madcap leers. for you have gone away betimes. No duos now. Just solo mimes. You are the clowning and the clowned. Then Robert read a poem he’d written whilst walking the labyrinth at Matara in June during the celebration of Chris’s life, and Angel finished with something she had written when she’d heard that Chris was unconscious and moving toward death back in December last year. In a labyrinth? “Orient”. East. Walk with me, just a few steps. See! A blue bench here! As we are, similar, but different. Each leaves, at our departure. In the evening, we drove out to a resort called Torre Canne to eat at Dal Moro, a fish restaurant on the coast. Chris and I had been there several times over the years. Sitting round the table, just a few yards from the sea, with Robert, Pia, and Angel, enjoying a bottle of white wine and some locally caught sea bass, was exactly the right way to end the day. How Chris would have loved it. Thank you Robert and Pia and Angel. Thank you La Luna nel Pozzo.